Tall fescue is a cool-season grass, well adapted to sunny or partially shady areas. When densely sown, a pure stand forms a moderate to coarse-textured lawn that is uniform in appearance with good weed and disease resistance. Tall fescue tolerates warm summer temperatures and stays green during cool, but not severe winter conditions. New varieties that are finer in texture and shorter in stature are known as turf-type tall fescues and dwarf turf-type tall fescues. 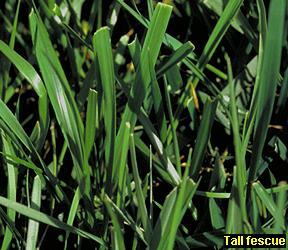 Tall fescue is a good species to plant for general lawn use and is the most common lawn grass in California. A coarse-textured medium to dark-green grass. 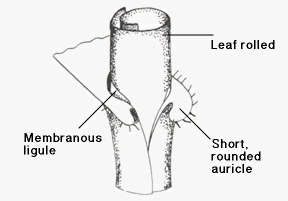 Leaves are rolled in the bud. 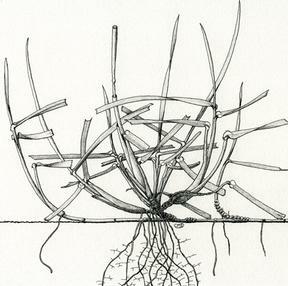 It has short, rounded auricles, a short membranous ligule, and an extensive root system. Because tall fescue has a bunch-type growth habit rather than a creeping-type, open areas may develop and need to be reseeded. Low maintenance. Tall fescue has excellent tolerance for heat stress and drought. It will tolerate moderate traffic and infrequent mowing. This species is not well adapted to high altitudes.